1) Questions 1-30: Conversion of small numerals to numbers. 2) Questions 31-60: Conversion of larger numerals to numbers. 3) Questions 61-90: Writing numerals. 4) Questions 91-100: Spot and explain the mistake in the numeral. 1) Can easily be broken up into different assignments/quizzes/etc. 2) Neat design is easier to take and grade. 3) Directions and point values for each section. 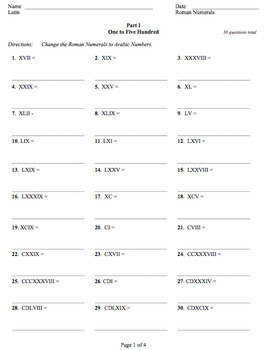 Makes a great worksheet for in-class drills or homework.